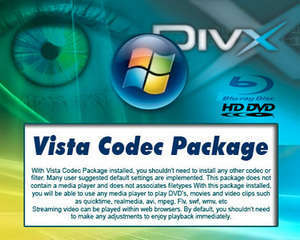 Vista Codec Pack is a set of filters and codecs that will allow you to view your favourite video and audio files. Unlike some of the codecs, Vista Codec Pack will give users the ability to choose what is installed using the public redistributable and after an unattended install, you can select to remove specific portions without removing the entire package. Vista Codec Package does not contain a media player. It does not associate filetypes. Version 7.2.0 is a freeware program which does not have restrictions and it's free so it doesn't cost anything. For security reasons, you should also check out the Vista Codec Package download at LO4D.com which includes virus and malware tests. Additional screenshots of this application download may be available, too. CC editing staff provide free downloads and reviews of the best and most-sought after video codec packs for the Windows operating system. Technical support is provided on our user forums. Check out some of the freeware downloads available in the video codec category. They contain no strings and are available at zero cost. Vista Codec Pack has a presence on social networks.